BEAUTIFUL 6 BEDROOM - 4 BATH POOL HOME - SLEEPS 12 !! JUST 2 MILES TO DISNEY!! THE KOKOMO is the place to go....'to get away from it all'. THE KOKOMO is a beautifully decorated and furnished 6 bedroom pool home in the prestigious gated community of Formosa Gardens Estates. Formosa Gardens Estates rental homes are the nearest to Disney World, less than 2 miles away. Guests will enjoy brand new granite counter tops and new stainless steel appliances throughout the kitchen, new granite counter tops and sinks in the master bedroom, updated Sunbrella outdoor dining set, and new pool side sun loungers. Your family will enjoy 4 king bedrooms (3 are en-suites), and 2 delightful twin bedrooms. The 'Winnie-the-Pooh' and 'Buzz Lightyear bedrooms are hand painted and extremely kid-friendly. The villa is equipped with pillow-top mattresses in every bedroom. Yes! Even the children's beds have luxurious pillow-top mattresses. In addition, the 4 king bedrooms and 'Winnie-the-Pooh' bedroom have HD,flat-screen TV's. You will vacation in comfort and style as you kick back and enjoy the family room with its wide-screen TV and DVD player, a fully-equipped kitchen, breakfast room, and the Grand Room with 14' ceilings. Enjoy the 22' x 40' pool area after an exhausting day at the theme parks. There is a screened-in lanai with patio furniture and an outdoor grill. The Disney-themed game room has a pool table, air-hockey, TV, X-Box with games, books, pub table and chairs. Baby furniture has been provided at no additional charge. A high-chair, crib/playpen, and a Winnie the Pooh stroller is available at the villa. Cable TV and free, high speed internet access are provided. To make your visit as comfortable as possible towels, sheets, dishes, coffee maker, toaster, pots and pans, laundry facilities, etc. have been provided to make KOKOMO 'your home away from home'. We invite you to 'get away from it all' and experience the fun and comfort of KOKOMO. This lovely villa accommodates up to 12 guests. It is centrally located for easy access to theme parks, convention centers, designer outlets, beaches, and golf courses. Kokomo is located one minute from the Formosa Shopping Village with restaurants, miniature golf, gift shops, full service supermarket, bank, pharmacy, and a 24 hour medical clinic. This villa is non-smoking. No pets allowed. Great home for family with kids! Everything was exactly like the pictures! Comfortable beds was a plus! The Winnie the pooh room had a crib which surprised us because it was not shown in the pictures and we have 1 year old twins that still sleep in the crib. We were planning to use the pack n play but since the crib was there and more comfortable. The pool was a nice size wasn't big but not too small just perfect for our family of 7. The game room we didn't use as much we didn't let the kids play with the pool table just the air hockey table they enjoyed. Kitchen was beautiful and well stocked too. We enjoyed our stay and my oldest did not want to leave as well I didn't want to leave either lol. I highly recommend it to other families and I will be back soon in the fall or Christmas! Our family of 12 ranging from 2yrs old to 78yrs old visited Orlando for the holidays. Although we have rented houses before, we wanted a ranch style home for this visit since we had a 2yr old with us and didn't want to worry about stairs. We LOVED this house. The owners were very nice and before we even arrived agreed to a special request at no additional charge. The location was great- located within a private residential community with grocery stores and restaurants easily within a 5 minute drive and only a 15 minute drive from driveway to being parked at any of the Disney parks. Also the driveway is large and easily accommodates 4 vehicles which is important since most communities here don't seem to allow on-street parking. Because our Orlando visits typically occur in the winter months, we always pay for pool heat and I can honestly say that this is the first house that we could actually tell that the pool heat was turned on. (Unfortunately there is no hot tub here, but when the pool heat kicks on, it was like being in one.) There was a minor issue about which we contacted the management team during our stay, and they were very courteous and prompt in responding. We were hoping to see fireworks from the house, and were able to see some when we were standing at one end of the pool, but not a lot; there's just too many trees. The only negative feedback we have is that the thermostat cannot be set to any lower than 74° with the air conditioner on and when the bedroom doors are closed at night, some of the bedrooms got a little warm, even though the ceiling fans remained on. Then again, we are from Ohio, so are maybe just used to cooler temperatures. To summarize we will plan to be back to this house for future visits. Thank you so much for your positive review! Your kind and thoughtful remarks are greatly appreciated! It was my pleasure serving the vacation needs of a wonderful group like yours and I hope you rent my Disney area vacation home in the future. Thanks again! This is a beautiful spacious home in a quiet well kept community. It has a well stocked kitchen and the bedrooms are huge. The pool area was very inviting. If I ever vacation here again, I would like to stay here again. I sincerely appreciate your kind and thoughtful review! It was a pleasure having nice people like you and your family as rental guests. I am hopeful that you will visit my Disney area vacation home again and to show my appreciation, I offer reduced rates to my repeat customers. Thanks again!! Beautiful & clean vacation home and less than 2 miles to the Disney parks! 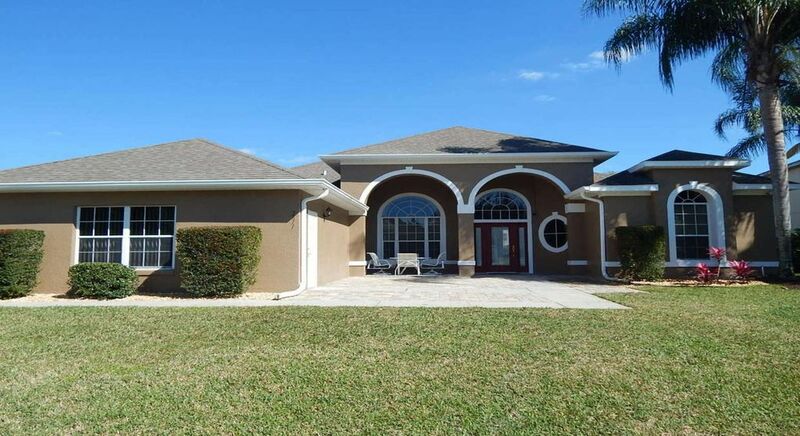 A BEAUTIFUL HOME CLOSE TO THE DISNEY PARKS, GREAT POOL. "WE LOVED THE PLACE"
I truly appreciate your flattering review! It is so important to me that you and your family had a great trip and found the vacation home to be comfortable, relaxing, and well maintained. It was my sincere pleasure to have rental guests like you and it would be an honor to serve your vacation needs in the future. To show my appreciation, I offer discounted rental rates to former/repeat guests. The house was perfect, and so close to everything. Thank you JoAnne and Louis. We are so happy that you and your lovely family had a great vacation! We truly appreciate your flattering remarks about our Disney area vacation home. You were excellent guests! Thank you so much for your business! Pool heat $30/day extra fee - optional but recommended for October - April Minimum stay 5 nights Note: Until confirmed, rates are subject to change without notice.